We’re halfway through the donations and we’re honored to be able to work with such worthy organizations that are making a difference for the communities in Wisconsin. After meeting with Karen DeSanto, Executive Director of The Boys & Girls Club of West Central Wisconsin, Rhyme found out that a copier for their Baraboo location was on their wish list for 2015 because the ink for their small printers was costing them way more than they wanted to spend. After finding out they were chosen for the donation, Karen responded, "what a GREAT way to start the day! We NEED this copier so much! Timing is everything also as we have a huge mailing that needs to go out....this is perfect!" 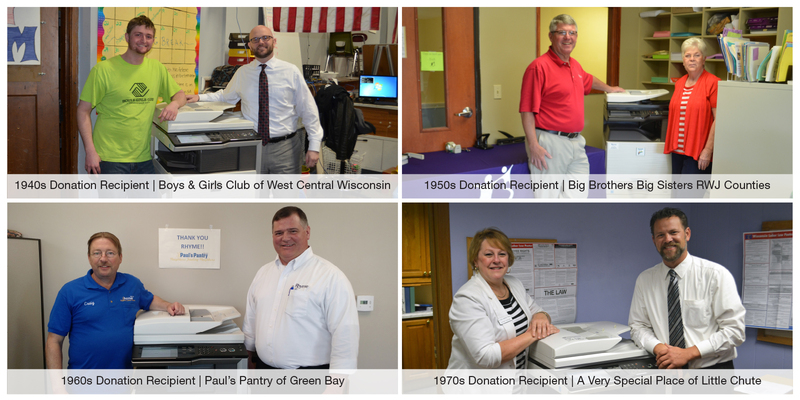 With the donation of the new office equipment the Baraboo Club will now be able to share their mission "to enable all youth, especially those who need us most, to reach their full potential as productive, caring and responsible citizens," to more people who want to support the club. The Delevan location was previously using multiple outdated machines to send their print jobs to. If they had a large color job they had to outsource it to Beloit, causing delays waiting for jobs to be finished. Now they have one color multifunction unit that they can send all of their print jobs to with better quality and efficiency. Paul’s Pantry, located in Green Bay Wisconsin, handles nearly 20,000 pounds of food daily. Founded in 1984 by Leo Frigo, the pantry supports hungry people in the community who are unable to purchase enough food for their family due to their little to no income. The pantry rescues over 5 million pounds of food from the marketplace each year and all inedible food is also donated to local livestock farmers. Paul’s Pantry has a staff of 9 people and relies on 25-30 volunteers per day to operate. They have never owned their own copier and had previously been using a machine located at their sister organization, St. Vincent de Paul, which is located across the street. The new Sharp copier is now located on site and will allow them to print professional looking signs and marketing materials for the pantry. A Very Special Place was developed at the beginning of this year when Haven of Hope, a care center for people with physical, intellectual and developmental disabilities, suddenly closed their doors to lack of funds. Families and supporters got the place up and running with help from the new Executive Director, Lorraine Yarbrough. Used office equipment was either left behind from Haven of Hope or donated from other individuals and businesses in the area. Unfortunately, none could get the job of running this new facility and spreading its mission to the community done. Rhyme donated a new color copier to A Very Special Place and as a result they are able to connect all of their employees computers to the machine and print to only one device. We have four more to go, so if you were thinking about submitting an application, it’s not too late! Fill out our online form today! Thank you again to everyone who has submitted an application or nominated an organization.